From the number of substitutions, to goal-line technology and ABBA penalty shootouts, football is always evolving. Even equipment that might be taken for granted, like goalposts, have changed dramatically over the last 150 years. 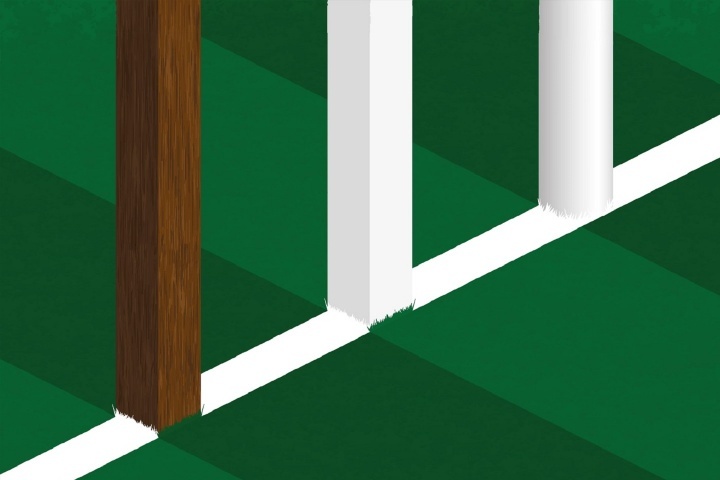 Introduced in 1863, the first codified Association Football rules established that the distance between the posts should be eight yards. This has remained the same ever since, becoming the international standard after FIFA joined the game's governing body, the International Football Association Board (IFAB), in 1913. But while the posts were set, the crossbar has had a much more contentious history. While some clubs used a string or tape in place of a permanent crossbar in the late 1800s, many didn't use anything, meaning that goals could be scored by firing the ball 20 or 30 feet into the air between the posts – resulting in many heated debates about whether goals should stand. The 1863 laws of the game expressly did not require or allow for a crossbar, tape or string. 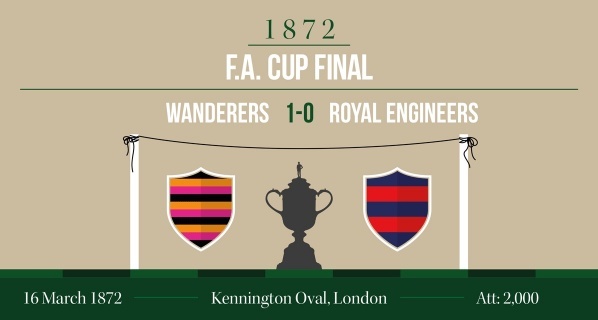 However, in an effort to reduce controversy, using a tape was required from 1866 and was in place for the first ever FA Cup final in 1872. Experiments with permanent crossbars began in the next few years, with Sheffield FC and Queen's Park both claiming to be the first club in the UK to install them. They finally became mandatory in 1882. As with the crossbar, goal nets were not required under the original 1863 rules. But, as a useful measure to help determine which side of the posts shots went, they quickly became seen as essential. Within a decade of the permanent crossbar, the football goal had changed forever as goal nets were also in regular use. 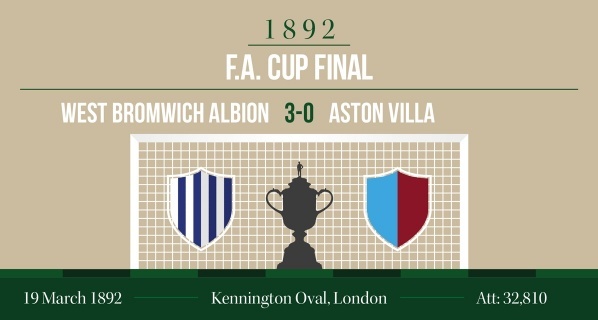 The 1892 FA Cup final between West Bromwich Albion and Aston Villa became the first to use both a crossbar and nets. Even with goal nets and solid crossbar, controversy and debate did not go away. There was a new challenge - determining if shots that deflected off the bar had crossed the goal line. 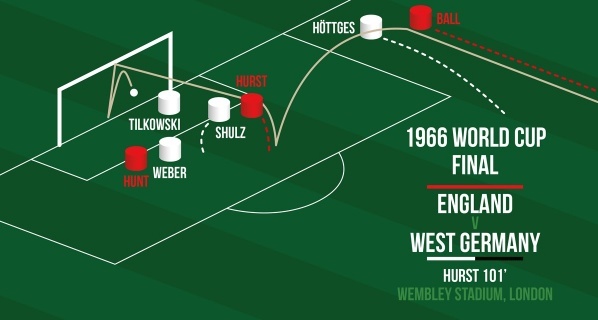 The most infamous example is still Geoff Hurst's second goal in the 1966 World Cup final. But numerous high-profile incidents in the last fifty years (including Frank Lampard's notorious disallowed goal against Germany in the 2010 World Cup) have resulted in goal-line technology becoming a fixture of the modern game. The construction of the posts themselves has also gone through a dramatic transition. Wooden posts, with either a square or rounded cross section, and often made from Douglas Fir, were common from the 1860s through to the 1970s. By the 1980s, wooden posts had been widely replaced with stronger, more durable steel by the majority of professional clubs. Soon after, aluminium rose in popularity as elliptical posts became increasingly common. 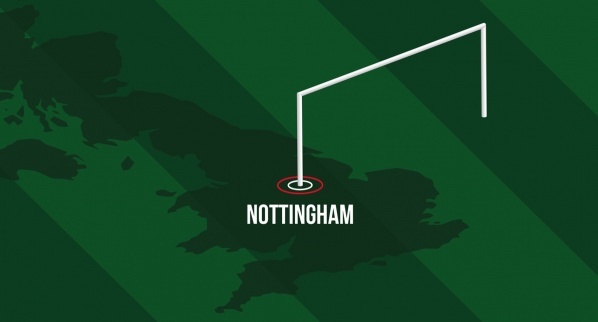 The elliptical post was developed in Nottingham in 1920 by the Standard Goals company and Nottingham Forest are thought to be the first team to use them. The shape helped to make posts more stable and secure when assembled, and the aluminium construction made posts more durable, easier to maintain and lighter – also making them safer. While many stadiums around Europe were moving towards rounded or elliptical posts, Scottish teams stuck resiliently to square posts. For most fans outside Scotland, square posts were an interesting curiosity, but there were some consequences. During the 1976 European Cup Final at Hampden Park, Saint-Etienne hit the woodwork twice, with many French supporters feeling that if either chance had struck a rounded post it could have gone in and changed the game. As it was, Bayern Munich won the game 1-0 and "The Square Posts" of Glasgow became a notorious part of French football folklore. Square posts were finally outlawed in 1987 and elliptical posts became the standard shape which is still used today. While the shape and structure of football goalposts has remained the same for over 130 years, the desire to test new innovations and try to improve the game has resulted in a consistent evolution. Modern crossbars, for example, now curve up slightly to counteract the pull of gravity, which could sometimes see the centre pulled downwards over time. Aside from changes to reduce controversy, much of the evolution of modern posts is the result of increased goalpost safety standards, especially for non-professional facilities where children may play unsupervised. As the leading goalpost manufacturer in the UK, goalpost safety is an issue that Harrod takes very seriously and are proud to be innovators in this field. For more information, check out Harrod's guide to goalpost safety.